I think one of the best meats to barbecue is pork chops. I recommend that you choose the parts that have some fat around the meat. The fat makes it more juicy and some of it will actually disappear when its cooked. Less fat will only make the pork dry and dull. Mix the oil and the vinegar together with the honey. Add the spices to your own taste. There should be a nice balance between the sweet honey and the peppers. Fill a plastic bag with the pork chops and poor the marinade over them. Press the bag around so the marinade spreads around all the pieces. Let them rest in the fridge overnight or for a couple of hours. When you barbecue the pork chops they should not be over an open flame. Wait until you have a nice glow. If the pork chops are not too thick they will be done quite quickly anyway. 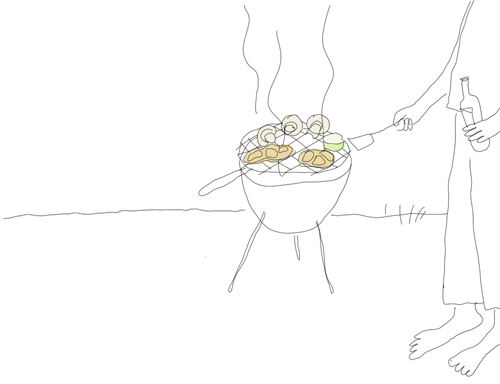 I really enjoy this barbequed meat and vegetables with a arugola/potatoe salad and some spicy red wine.